When I was still living in the Midwest, I asked my friend M if there was anything he missed about living in Los Angeles. He suddenly got a far-away look in his eyes and quietly murmured, “The boat noodles at Sapp Coffee House. Oh god, those noodles.” I’d never made it to Sapp during my previous time in California, and I more or less forgot about M’s haunted reference until I happened to be looking for a place to eat in Thai Town around Christmastime. We decided to give it a shot and were pleased to find Sapp to be a bright, friendly spot with some of the tastiest Thai coffee around (it is a coffee shop, after all). B and I decided to share some boat noodles with beef and the also much-hyped jade noodles. The boat noodles were as amazing as M had promised: slightly chewy and swimming in a dark, silky broth. Yeah, I know, boat noodle broth is made from blood, but you probably know by now that blood doesn’t bother me in the least. This is the kind of thing you want to eat on a cold rainy day. But for me it was the jade noodles that were a total revelation. 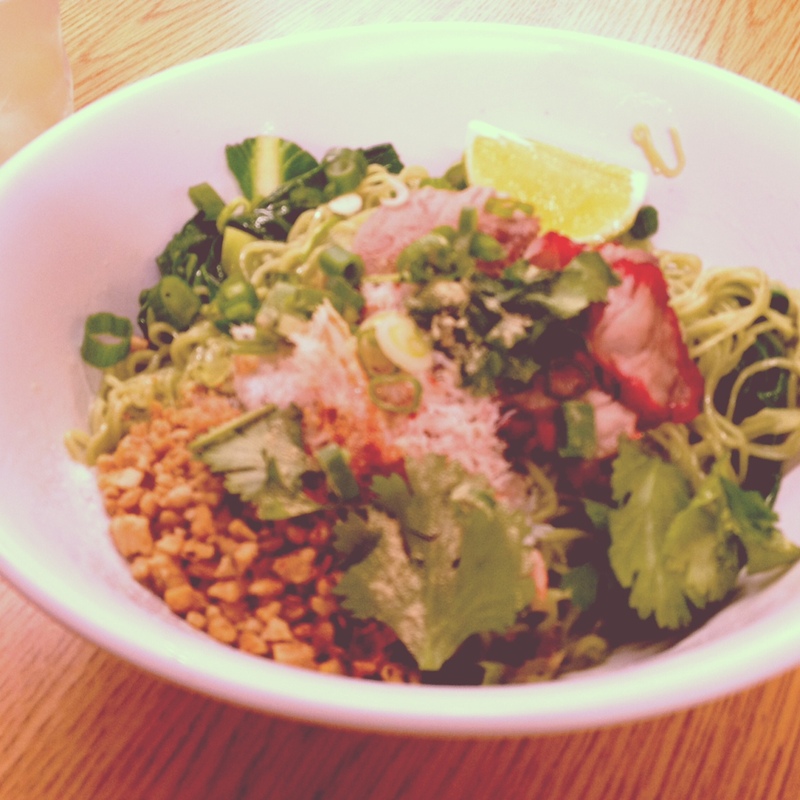 Roasted duck slices and barbecue pork chunks, a downy pile of crabmeat, scallions, cilantro, peanuts, chiles, and sugar top a mound of green noodles. Talk about trayf! There is something about the sparkly sweetness against the subtle heat against the herbaceous noodles that just really kicked it into gear for me. I could eat those noodles every damn day. And at about six bucks a bowl with some of the sweetest employees around, that doesn’t seem like such a bad idea.